Today is International Zookeeper Day and we’re going wild for zookeepers around the globe and our very own here at DZG. 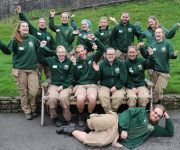 We have 34 dedicated zookeepers – aged 18 to 51 – who work on a full and part-time basis and love what they do looking after our collection of amazing animals. International Zookeeper Day … Continue reading It’s zookeepers’ day!